Warren Lehrer will be at Bank Square Books for an author signing and to present a multimedia performance/reading on Monday, September 29th at 6:30pm. Please call 860-536-3795 for more details. 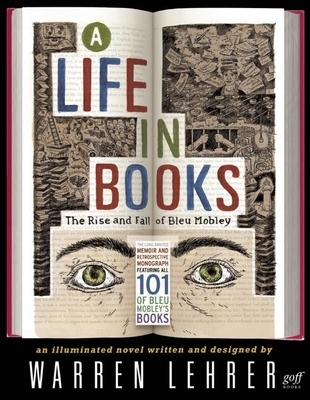 A LIFE IN BOOKS: The Rise and Fall of Bleu Mobley is an award-winning “illuminated novel” containing 101 books within it, all written by Lehrer’s protagonist—a prolific and controversial author—who finds himself in prison looking back on his life and career. Over the course of one long night, in the darkness of his prison cell, he whispers his life story into a microcassette recorder, tracing his journey from the public housing project of his youth, to a career as a journalist, then experimental novelist, college professor, accidental bestselling author, pop-culture pundit, and unindicted prisoner. The novel pairs Mobley’s reluctant memoir with a review of all 101 of his books. Each book is represented by its first-edition cover design and catalogue copy, and more than a third of his books are excerpted. In his funny, entertaining and thought provoking performance, Warren Lehrer presents an overview of Bleu Mobley's life in books via many of Mobley's cover designs and other biographical materials including animations, and video performances of Mobley book excerpts. The resulting retrospective explores the creative process of a writer/artist, as it reflects upon a half century of American/global events, and grapples with the future of the book as a medium as well as the lines that separate (and sometimes blur) truth, myth, and fiction. Written and designed by acclaimed author/artist/performer Warren Lehrer, A LIFE IN BOOKS is an extraordinarily original, funny, heartwarming and heart-wrenching exploration of one man’s use of books as a means of understanding himself, the people around him, and a half-century of American/global events. This four-color, full-length novel fuses art and literature, and distinguishes itself as one of those books you’ll want to hold in your hands, feast your eyes on, read and re-read, share with friends, and treasure for years to come.